May the Fourth be with you! 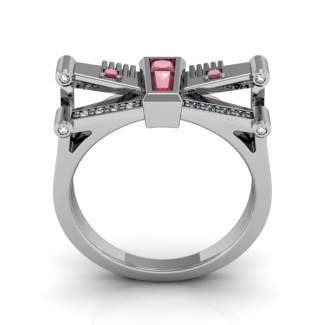 I wanted to design a ring that is as much fun to wear as it was to design. This X-Ring is inspired by the ship piloted by those meddling kids and their wilhelm-screaming robot ready to take the fate of the entire galaxy on their shoulders. A two level split top ring, the center is actually two smaller stones. One straight baguette and a larger created ruby princess cut stone. 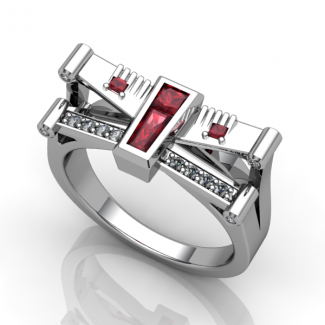 Two princess cuts are in the back "wings" of the ring and smaller HSI1 quality diamonds are in the front lower "wings". 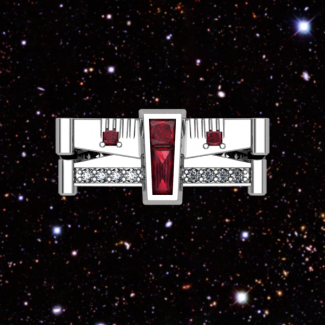 There are four bezels at the end of either of the wings facing forward. 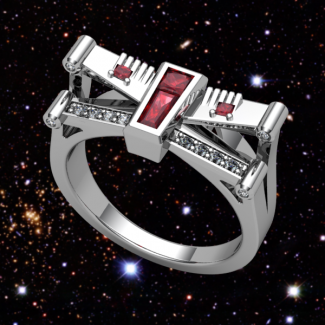 All readily available variations of this ring have lab created rubies. 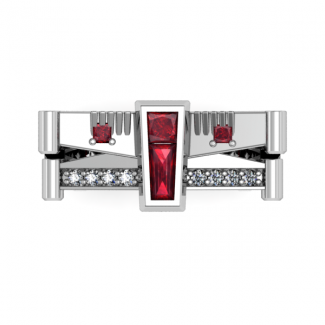 Genuine "AA" Rubies are available by custom order.